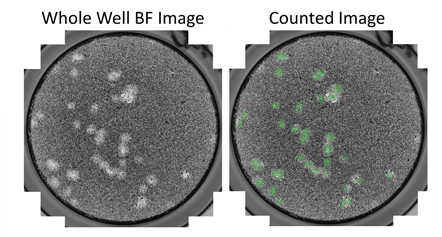 The ability to quantify viral infectivity by automated counting of plaques and foci is highly important. In order to rapidly and efficiently determine viral infectivity, multiple conditions or titrations need to be tested with the virus and host cells. There are various types of plaques and foci using horse radish peroxidase or fluorescent labeling with markers or proteins. 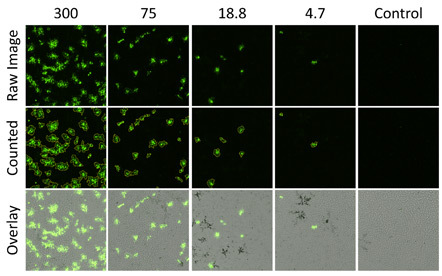 These allow the development of high-throughput counting of foci and plaques. 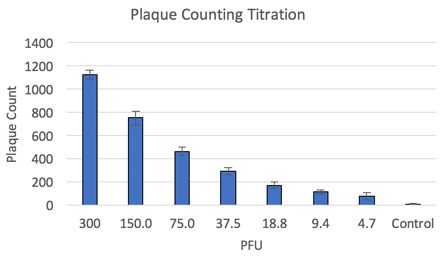 Celigo showed highly comparable plaque counting results to manual counting method. 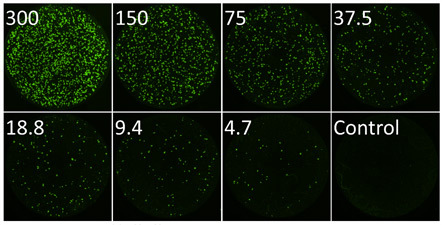 The top set of images show the whole well imaging of fluorescent viral plaques captured on the Celigo image cytometer. A whole well image was captured for each viral dilution providing a whole well view of the viral infection. The top row shows zoomed in images of viral fluorescent plaques captured of the Celigo. The middle row is the viral plaques that have been analyzed by the Celigo software. The identified plaques are automatically circled by the software. The bottom row is showing an overlay of the bright field and the fluorescent images. The Celigo software allows for the overlay of multiple images from multiple channels to be overlayed with a click of a button. Once the viral plaques are imaged and counted by the Celigo all of the data is exported to excel for further analysis. 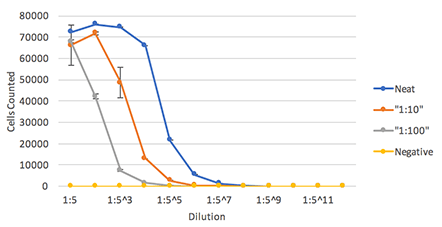 The number of viral plaques is graphed over the performed dilution series of the virus. This data shows that the number of viral plaques is directly related to the amount of virus added to each well.